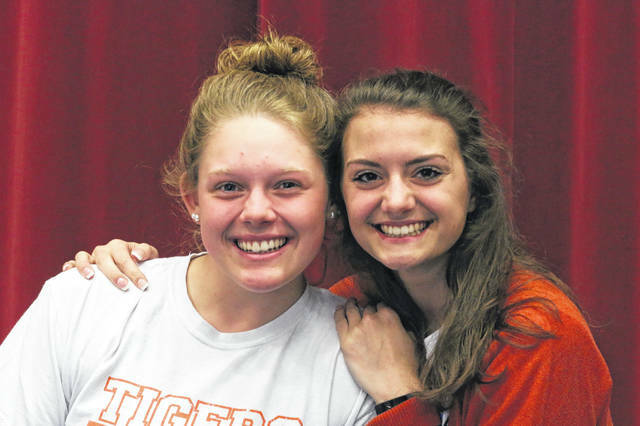 GALION — It is an incredible honor to be a highly sought after student athlete and the Galion Lady Tigers track and field team has at least two graduating this spring. Soon-to-be graduates Bri Streib and Marissa Gwinner signed letters of intent to continue their education and their athletic careers at Tiffin University. The first Lady Tigers standout to commit to being a Dragon for the next four years was shot put and discus extraordinare, Bri Streib. Back on Wednesday, April 11, Bri, joined by her mother and step-father, Anita and Brian Conley, as well as coaches Todd Roston, Brent Tyrrell and Doug Court, gathered in the cafetorium of Galion High School to put ink to paper. Streib’s father, Jeff Streib, was unable to attend the signing. “I know the coaches and it came down to them (Tiffin) having the best team, the best family fit for me and the best financial offers…it also helps that it’s close to home,” states Streib on her collegiate decision. Streib, in addition to throwing for the Dragons, plans on pursuing a Business Administration path. “I really want to go into sports management or sports operations,” claims Streib matter of factly. Bri has been a highly decorated member of the Lady Tigers track and field team since her freshman year. Streib has won the Crawford County Meet shot put event in each of her four seasons and is a two-time discus winner in the meet as well, both of which have also led to Co-Most Valuable Player awards in the field events at the meet. Streib also attended the New Balance Nationals, an indoor track and field meet showcasing talent from across the country. Bri is currently the Galion High School record holder in the discus and is hoping to claim the shot put record before the season concludes. Streib also played in the band throughout her time at Galion High School, in addition to swimming and being a member of the National Honor Society for her work in the classroom. 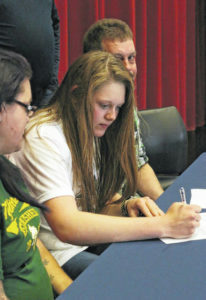 On Wednesday, April 25, the Dragons got another track commit from the likes of Marisa Gwinner. 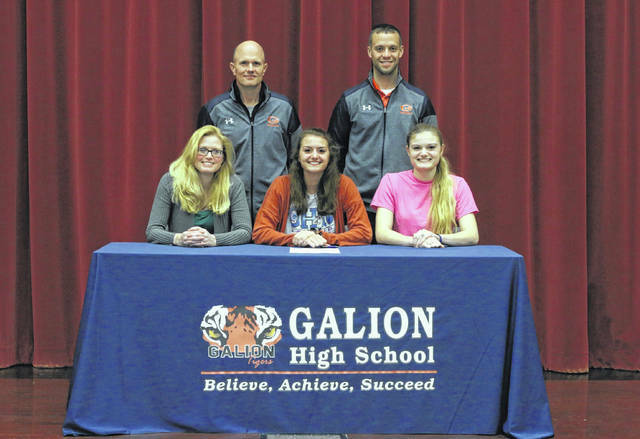 Marisa was joined by her mother, Lori Gwinner and sister, M’Lynn Maddox, as well as coach Roston and jumping coach Mike Moore, in her signing in the Galion cafetorium. Gwinner’s father, Doug Gwinner, was unable to attend the signing. Marisa plans on working toward a degree in communications and persuing a minor in advertising in her time in the classrooms of Tiffin University. “It’s one of the many things that I plan on succeeding at in my time at school. It’s a pretty broad field but there will always be jobs available and you can use it anywhere,” proclaims the confident Gwinner. Gwinner’s list of accomplishments in competition throughout her time in high school are unrivaled by most any student athlete in the area. Gwinner has seen more than her share of successes in volleyball as well as in track. Marisa is a member of the 1,000 kills club in volleyball, in addition to being a three-year letterwinner, a member of the All-Ohio second team and owns a Mid-Ohio Athletic Conference MVP award. In track, Gwinner owns three school records; the high jump, the long jump and the pole vault. She has also qualified for the State Track Meet in all three years leading up to this season; that includes two regional championships and three district championships. Marisa earned All-Ohio honors twice in high jump in her freshman and junior seasons. 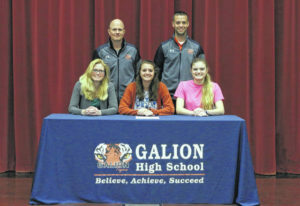 The Galion Lady Tigers Bri Streib signing her national letter of intent to attend Tiffin University on Wednesday, April 11. Streib will continue her throwing career for the Dragons while attending classes and working towards a degree in Business Administration. Galion track standout Marisa Gwinner (seated, middle) poses for a picture with her mother Lori (left) and sister M’Lynn (right) as well as coaches Todd Roston and Mike Moore after signing her national letter of intent to attend Tiffin on Wednesday, April 25. The Galion Lady Tigers Bri Streib and Marisa Gwinner, who also happen to be best friends, will be teammates for years to come as both student athletes will be attending Tiffin University next fall.